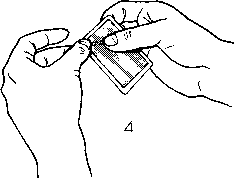 The inserted card is held in position by the tip of the left forefinger. 5T^P fOUH. - Hold the phony sandwich with both hands. 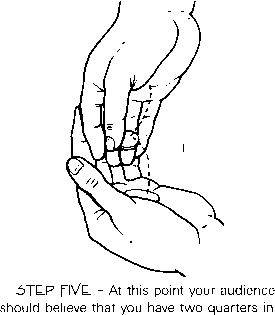 Direct a spectator to hold the "center Ace" between her thumb and forefinger (FIG. 9), then make the following statement: "I'm going to take the top card away with my right hand and the bottom card away with my left. You get to keep the Ace." As you finish your statement, sharply turn both hands palm down (Figs. 10,11). Your right hand takes the top card, your left hand takes the bottom. The turnover should leave the two cards in line with one another. 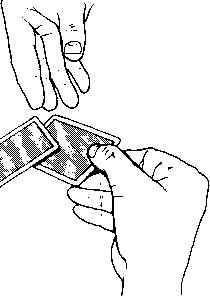 The sharply-down sideways turn of the left-hand card cleanly snaps it out of the spectator's grasp — causing the Ace to instantly vanish out of the spectator's hand. Drop your two face-up Jacks onto her hand and allow your bewildered spectator a moment of silence. Gently draw your spectator out of her shocked condition and slowly spread the deck to reveal the vanished Ace. I often end with the vanish without reproducing the Ace. The vanish leaves them out there in a timeless never-never land. The reveal brings them back to earth. It all depends upon what kind of experience you want to orchestrate. You're right thumb slides the face-down "Three of Hearts," between your right first and second fingers. Table the deck then insert the single between the "pair" to get into "Bizarre Vanish" position. • For the aggressively unconvincable, at Step Two you can add the audible "Snap Count" convincer from "Illusion" (see Index). I once asked Daryl the secret of his phenomenal success. The master close-up artist cryptically replied: "Time flies like an arrow, but fruit flies like a banana." With this basic philosophy of life as a guide, Daryl has managed to fly around the world with nothing more than a pack of cards and a change of underwear. This inspirational pilgrimage recently won Daryl the Magic Castle's Close-up Magician of the Year Award and a pair of gold-plated briefs from Fruit of the Loom. Daryl's "Close Quarters" effect is one of those embarrassingly direct "why didn't I think of that?" presentations that will be hungrily devoured by professional table workers and discerning Fruit Flies everywhere. ELFF^CT ~ Two quarters held in the performer's hand are transformed into a single half-dollar. Daryl makes this a big effect by selling the details, If you want your audience to know that you're doing something wonderful, you've got to tell them about it first! 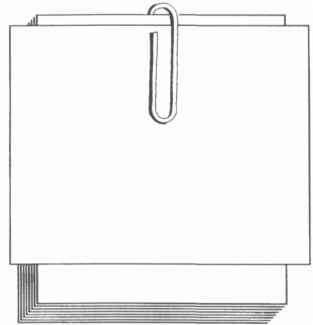 PREPARATION - Place one quarter and one half-dollar in a convenient right-hand pocket. 5TE-P ONE. - In your very best Puerto Rican gambler style, sashay over to a "magician-by-request-only" table while suavely causing the two coins to tinkle in your pocket. Perhaps one time in ten an astute spectator will remark, "My goodness, it sounds to me as though you have two quarters tinkling in your pocket." This, of course, is the perfect introduction to the routine. Most times, however, you'll just have to make this observation about the quarters yourself. 6TE-P TW10 - Remove the "first" quarter from your pocket with your right fingers and flip it into the air and pretend to place it into your left hand. An added convincer here is to say, "I will place this first quarter into my left hand." 6TE.P TtlRE-E. - As you reach into your pocket for the "second" quarter, drop the palmed quarter, palm the half-dollar and pick up the first quarter that was originally palmed. This is especially nice when set to music. .5TE-P F^UE. - Display the second quarter on your right fingertips, flip it into the air, and pretend to place it into your left hand with the first quarter, while actually allowing the concealed half to drop from the palm, clink off of the finger-palmed coin and into the left hand. The clink pass sequence is over-illustrated in FIG. 1.
your closed left hand. If you hear someone say that you have a half-dollar in your closed left hand and the quarter finger-palmed in your right hand, then it's time to move on to a less critical audience. Dump the palmed quarter into your pocket as you remove either a pinch of fairy dust or an invisible hair ball Sprinkle your dust, bounce the ball, then open your hand. The two quarters have transformed into a single half-dollar! Tilt P.Jj. PE.L5LHTATI^Nl - Hire your mom to weld two quarters together for you. Use this molten mess in place of the half-dollar. When you go to your pocket to dump the second quarter, come out with a cigarette lighter. Direct a spectator to hold your wrist and wave the flaming lighter near your closed hand. Announce that you are magically welding the two quarters into a half-dollar. Comment that the hot flame from the lighter combined with the burning passion of the spectator may be too much heat for the little quarters to bear. Open your hand and reveal the magical melt-down. This was inspired by a Ripley's "Believe-lt-or-Not" story about a man in prison who was forced to take up bar magic as a hobby. After a few years of this meaningless existence, the prisoner decided to commit suicide in a practi-cal-yet-entertaining fashion. His background in chemistry had taught him that the red ink on playing cards contained phosphorus and other explosive elements. The ingenious prisoner used this little known fact to construct a homemade bomb out of scraped-off card ink, cotton mattress padding, and a piece of pipe. Then somehow, believe it or not, he managed to blow his brains out. The performer illustrates this tall tale by taking a real playing card, rubbing its index corner to warm up the ink, then strikes it on a match-book. The friction combined with the heated ink causes the red pips to ignite - and the card to burst into flame. Believe it or not. 6TE.P ¿?NlE. - While skillfully misdirecting your audience's attention elsewhere, secretly insert a paper match under the non-sandpaper flap of a closed matchbook (FIG. 1). (Note that the non-business end of the match is under the flap.) 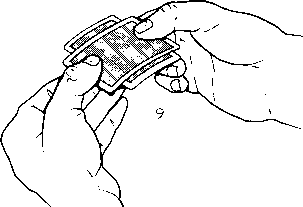 Put the prepared matchbook sandpaper-side up and toward the audience in an out-of-the-way place on the table. 6TE-P T\V& - Go through your explosive build-up as described in the first paragraph. When you've got your audience sufficiently primed, pick the card up in your right hand and the matchbook in your left. The book is held between your thumb on top and second finger below. Press your second finger onto the concealed match head and pull it back slightly, disengaging the match from the flap (FIG. 2). Immediately follow up with a second dud strike. 5TE.P F£?UE. 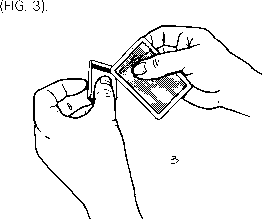 - Table the matchbook and then use your left second finger to adjust the concealed match so that its head is flush with the card's upper left corner (FIG. 4). This adjustment is done undercover of "removing moisture" from the card by snapping its corner with your left thumb. 5TE.P HN/E. 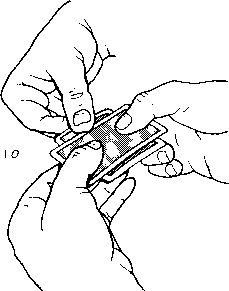 - Pick the matchbook up with your left hand and light the card (FIG. 5). A second after the match flames, slide the match back away from the corner (FIG. 6). The corner will remain lit for a few seconds even though the match has gone out. 6TE.P 6IX - Wet your left second finger and pinch the burnt corner, at the same time cooling off the hot match head. Dump the match to the floor as you toss the burnt card out for examination. Eric uses the flaming card to casually light someone's cigarette. This is a fine idea.